Episode 3 subs are already out. Just got done watching episode 2, and my already extremely high opinion of this show is only getting higher. There's everything to love about it and nothing to hate. The actual tokusatsu-related content is extremely authentic, and the writing effortlessly combines charming, briskly paced comedic antics with social drama that's WAY more in-depth than it has any right to be. Stuff like Nakamura and Yoshida carrying on totally different monologues in their heads and the twist at the end of the episode are just fantastic. I know this is edging into hyperbole, and I kind of hate saying things like this, but everyone on this forum should be watching this show if they aren't already. I just can't imagine anyone here not enjoying it. At any rate, I know I am. Still no word on any sites streaming this yet? That Emerjason scene. Emerjason is so cool. I love the Hell out of this show. it's relatable in a lot of ways. When she said how she learned to do good or that she got good examples from Toku shows I thought of Ultraman Geed and his, "sitting around doing nothing wont get me anywhere" motto,.. which I actually have told myself at times when overwhelmed with work. So I related. It really is a good show. It manages to be meta and a toku show at the same time. Which is probably not easy to pull off, but they seem to be doing it. You don't say ! More than often I feel as much embarassed as Nakamura just watching. 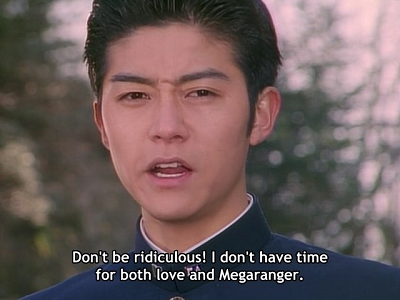 Yeah, I also recommand, everybody here deserves a feel-good show about being into toku. You know, it might be a good thing this show isn't going to run very long, if only because I won't have to keep repeating the same praise dozens of times over. Episode 3 stood out for just how closely it paralleled the Sentai formula it was homaging though. Definitely the best use of the Jushowan clips yet. See, and I can relate to you relating to that, because as a massive Geed fan, I've done the same thing. That's what's great about this show. If I were to nod in agreement at every part that hit close to home in some way, my neck would be sore by the end of any given episode. everybody here deserves a feel-good show about being into toku. They do. They really, really do. 7 episodes mean 14 half hour long, but it's odd this isn't a sitcom like duration. Episode 3 resonate and feel more relatable. Finding support and able to talk about your hobbies without being fear of ridicule by condescending voice is good. Really glad this show is going over so well. I've been antsy for the new episode all week. Every time I check the sites and still see episode 3 I'm all ….